Since joining the global Urban Sketchers movement in early 2014, Rob has been invited to many locations around the world to run workshops, most often on all things related to iPad creativity and urban sketching, using the app, Procreate. From events at Apple, to teaching at Urban Sketchers Symposiums for the last 3 years, and delivering a workshop series for art teachers at the Singapore Teachers' Academy of the Arts, Rob loves helping people explore creative expression, especially using what he often refers to as 'The Ultimate Mobile Digital Studio'. If iPad Sketching workshops among mountain views, great street food, glamping by a shimmering lake, capped by a 5-star experience sounds good to you, hit the link to find out more about what your host, Anna Barnes of ArtFoodCulture.com has in store. Join me for 11 days and 10 nights on a one-of-a kind iPad Sketching holiday! For the 5th year running, Rob has been selected to join the Urban Sketchers Symposium faculty. This year, he will offer a workshop teaching participants how to use iPads and Procreate to draw people; specifically, one of the icons of Amsterdam - cyclists! 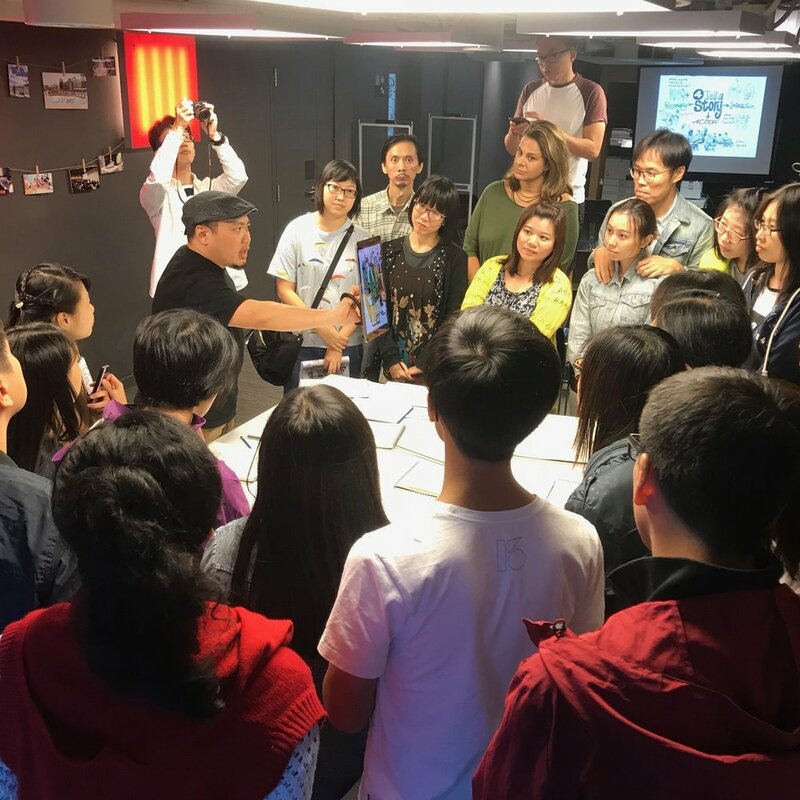 With the surging interest in iPad Urban Sketching, Rob conducted his first workshop in 2019 at home in Hong Kong, which saw participants familiarize themselves with the digital medium. Many exercises demonstrations and hands-on instruction were held in-class, as well as on sketchwalks in the downtown Central area of the city. Rob joined other instructors in offering a workshop in conjunction with Urban Sketchers Hong Kong’s 2nd year participating in the global USk 10x10 workshops series. This gave him an opportunity to share the people-drawing workshop he gave in Porto at the 2018 USk Symposium. After the popularity of Rob’s People-drawing Party in Porto, he was asked to offer it to a group from Urban Sketchers Ribble Valley while visiting the northern region of the UK. For the 4th time, Rob was part of the international USk Symposium faculty, teaching at the annual Urban Sketchers Symposium. 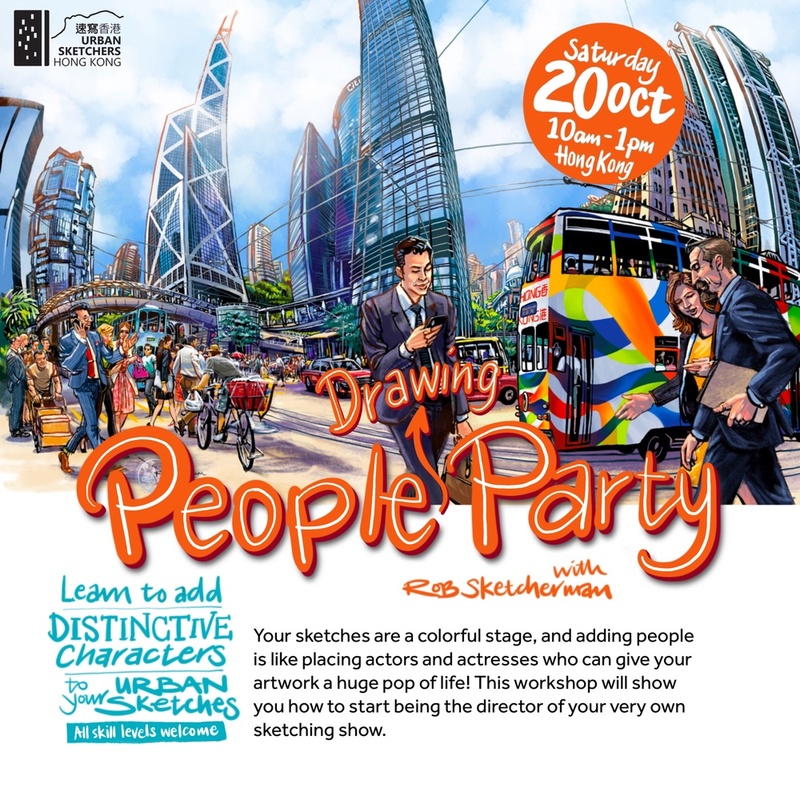 This year, Rob taught sketchers who fear tackling the subject of drawing people, and armed them with the tools to add not just people, but fascinating characters to their sketches and artwork. After Rob illustrated and designed the cover for Champion REIT’s 2017 Annual Report (which won the Gold and Silver Illustration Awards by International Annual Report Design Awards), he was invited to give a talk explaining his creative processes and professional workflows using only his iPad Pro and a complement of powerful iOS apps. Rob was invited by the flagship Apple Store in Singapore to speak and demonstrate the way he captures people on his iPad, with his favorite app, Procreate. He also shared a simple, 4-step process to draw faces in profile with perfect proportions, and helped participants create gifts for family in conjunction with Mother’s Day. 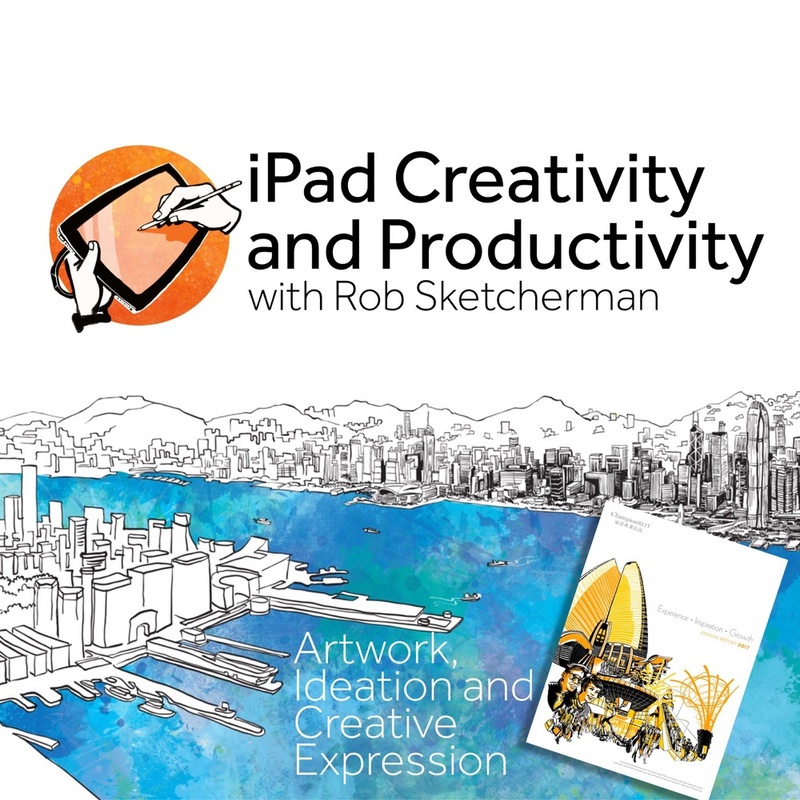 Rob brings his workshop series introducing iPad Sketching with Procreate to his home town of Hong Kong. Over the course of 7 hours in one single day, Rob walks participants through various demonstrations and step-by-step exercises, transforming those who know next to nothing about using an iPad or Procreate to draw, into budding digital artists who understand the immense creative potential of their iPads. At the invitation of the Singapore Teachers' Academy for the Arts (STAR), Rob ran 3 different workshops over 5 full days, targeted specifically at art teachers from Singapore's public education system. Held at the Academy of Singapore Teachers, these workshops explored a variety of diverse applications for iPad creativity and its application in the classroom, from urban sketching to mindmapping to digital journaling, digital content creation using a combination of creative apps, and how all this artwork can be translated into everything from PDFs to prints, posters and even theater sets. In November 2017, Apple initiated a special event in conjunction with Urban Sketchers 10th Anniversary. Rob was invited, along with 3 other urban sketchers from San Francisco, Berlin and Singapore, to conduct a Today at Apple sketch walk at flagship Apple stores in their home cities, where each artist showed members of the public the fun of using iPads and Procreate for drawing on location. The Planning Department of Hong Kong commissioned a series of urban sketching workshops for the public from Urban Sketchers Hong Kong, and Rob, along with the other administrators of the group, taught a workshop each at City Gallery, to introduce the public to various aspects of urban sketching. While in California in 2017, Rob was invited to conduct his first Today at Apple event at the global Apple flagship store at Union Square. He introduced the basics of Procreate, after showing examples of his urban sketching adventures around the world, then took all participants on a sketchwalk around San Francisco’s Chinatown. 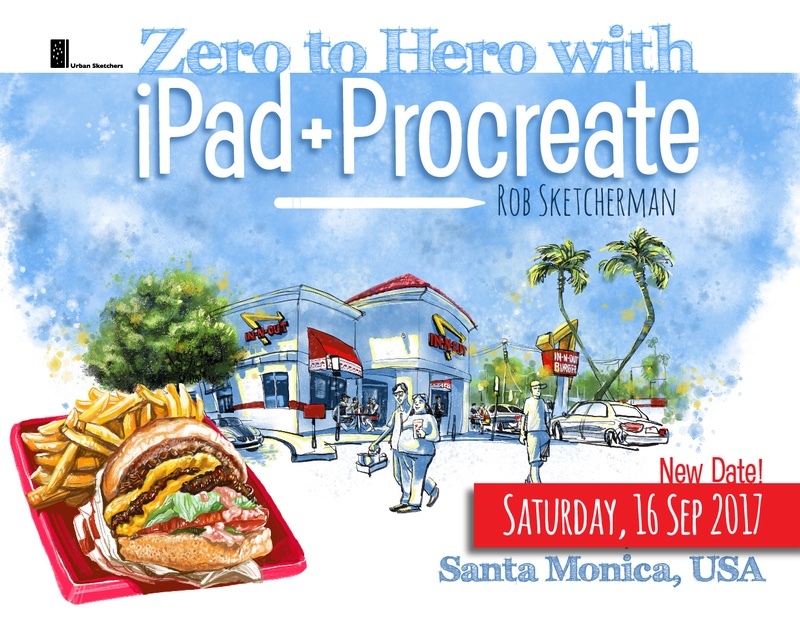 While in the US in 2017, Rob ran his first Zero to Hero with iPad+Procreate workshop in Los Angeles. Over the course of one full day, he introduced participants to the potential of urban sketching with Procreate on their iPads, including sessions of sketching outdoors, with one-to-one guidance. Due to overwhelming demand, he ran 2 more sold-out workshops in San Francisco and Santa Monica in the following weeks. For the 3rd consecutive year, Rob ran a workshop at the annual Urban Sketchers Symposium, helping those new to digital sketching see the potential of using Procreate and their iPads to head out and draw on location. 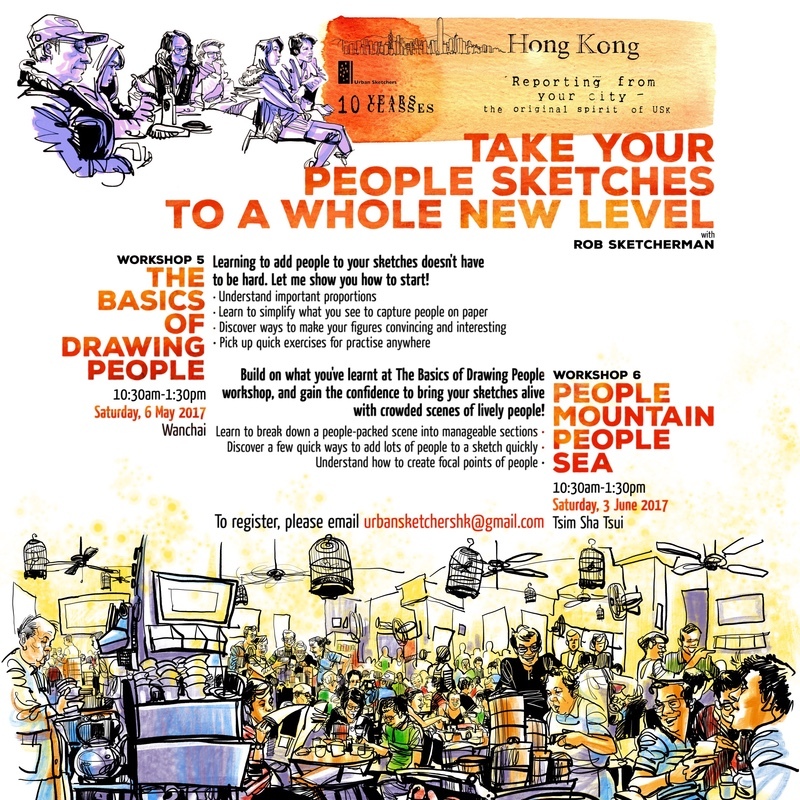 In conjunction with the global initiative celebrating Urban Sketchers 10th Anniversary, Rob organized a series of sketching workshops under the Urban Sketchers Hong Kong (USkHK) banner. Along with other instructors from USkHK, Rob taught workshops that aimed to help new sketchers learn and build on their urban sketching skills. He taught two 3-hour sessions on ways to begin adding people to sketches. After participating in Sketch Tour Portugal, covering the 100th year Anniversary of the Apparitions at Fatima, Portugal, Rob also ran a workshop introducing iPad urban sketching to members of the public in the charming city of Lisbon. @robsketcherman and Louisa - thanks for giving us a great learning opportunity! I loved the way the class was taught (not intimidating at all). I’ve already put my new skills to work. Rob, you and Louisa were amazing! Thanks so much for teaching, entertaining and keeping us hydrated and well-cared for. I was so impressed with how well you presented the technical and artistic material and how energetic you two were in the unbelievable heat. I was also impressed with my classmates and their wonderful art and ability to take in all the tech (which I love but which most people I know quickly give the deer in the headlights look). If there’s any chance of a follow up session for Procreate 4 i’d love it! Overall the workshop was very informative, inspiring, and provided excellent resources on various relevant apps that enhance the workflow. Rob shared many useful accessories such as the iPad holders, Paperlike screen protector, various battery packs and even different portable chairs. Both the classroom and outdoor exercises were well organised. The workshop dealt comprehensively and collectively on most common issues in digital urban sketching. Most fruitful to me is having a better understanding of the process of digital sketching with an iPad+Pencil on Procreate apps. I spent the whole day today immersed in the iPad Pro and Procreate! Excellent and inspiring workshop!! Thanks so much Rob and Louisa for the wonderful class! I learned a lot and it was fun. Louisa you really saved us by keeping the ice water coming. I’m so glad I came. I have to say BIG THANKS to my buddy Rob and Louisa for organizing the workshop which has solved many queries I have in mind for a long while. The sequence of the workshop suit for anyone and it is really from ZERO to SUPERHERO. I bet many can draw something with Procreate, but mastering it is another story; After the workshop, I would like to call myself a “procreate ready” sketcher. Rob, thank you for a wonderful workshop! You are an amazing teacher! I learned so much. It was very inspirational. It was also a great pleasure to finally meet you in person! Thank you! We had a ball too, Rob. The workshop was so fun and you are a gifted teacher. I could hardly sleep last night because I was so excited to try everything you taught us!